Steve Jenkins is one of those prolific authors whose offerings seem to blend together after a while. However, he and Robin Page do have some stand-out titles and I think this new offering is one of them. While the book keeps the usual format of a Jenkins/Page offering - paper collage animals against a white background with small chunks of information - if offers a unique and humorous approach to how animals behave. After the introductory spread, each page details step-by-step information. Want to hunt like a reddish egret? There are three steps and one cool trick to know. Need to know how to defend yourself like an armadillo? It will take some practice, but you have six options to try, depending on what's coming after you. 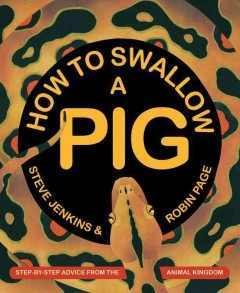 And if you want to swallow a pig like a python, as shown on the front cover, don't forget step six - "Rest. Once the pig is completely swallowed, take a nap. You won't have to eat again for several months." This will give you plenty of time to decide on your next animal to imitate! There is a lengthy follow-up section in the back with further information about the animals along with thumbnail pictures of each one. A brief bibliography is also appended. You can also go to the authors' website to learn about how the book was made. Although this book isn't quite as good as some of Jenkins' and Page's other titles for storytime, it would make a great subject for a book club, program, or classroom. After you've studied some of the animals, come up with instructions for other animals not included - or even for human behaviors! Verdict: A stand-out in the many titles created by Jenkins and Page, this is one you'll definitely want to add to your collection. fun - this is at my outreach site for middle school. Last day of vacation. I was going to do things and I mostly slept all day instead. Jess got the fun of a Monday night during the full moon and with a cancelled storytime because Pattie was out of town. I just borrowed my outreach storytime for toddlers, then belatedly remembered I needed a craft. I had the kids glue a die cut frog to a stick then poke it up a hole in a plate - hoppy frog on a lily pad. Then I spent a couple hours painting with the middle schoolers. There were over 30, all voicing their delight at being liberated from school at the top of their lungs. Literally, at least half of them screamed and yelled nonstop for over an hour. How do they have the lung power? I was hoarse after storytime this morning! I had Jess just do a block party with everything that's going on. I hope I haven't caught anything from the kids, but I am not optimistic. Even more hoarse, but we had fun. One of my aides is down with suspected pinkeye. We refused to let her enter the workroom. It's definitely pinkeye. I don't know what happened today but there was an insane number of people in the library. Oddly, that did not translate to people at Messy Art Club, which was relatively small and relaxed (except for several kids who broke down in hysterical tears and others who decided to turn it into paper airplane club and test-the-librarian's-patience club). Then I remembered that I told a teacher she could bring her high school class tomorrow morning so I better be at work on time. My feet hurt. Never have I been so grateful for the end of a week. Ok, that may be somewhat of an exaggeration, but I really need to start getting more sleep. I'm really bad about proper eating and sleeping, especially on vacation, which doesn't make coming back to a huge workload any easier. Cleaning out email, sorting through all the new display things I got and updating displays and magazines, cleaning off desk, etc. Wimpy Kid is suddenly insanely popular and we're hauling all the extra summer copies out of storage. Someone saw our facebook page and came in to look at the toy bags! I think Bone and Wimpy Kid must have been in the Scholastic book order or something. The description of this title sounded rather ho-hum, but I love Jessica Meserve's illustrations and was interested enough to read it to go to a little extra effort. Sophie and Stanley are best friends. They do everything together and take turns playing in their yards. Until Stanley gets a dog. A big dog. Her name is Misty and Sophie is scared of her. 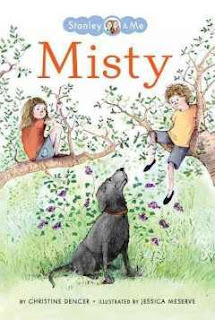 Sophie stays away from Misty until she has to face her fears in order to help her friend. Will Misty be as scary as she looks? Meserve's illustrations are simple but heartfelt. Soft colors and expressive faces fill out the simple story and blend smoothly with the gentle plot. This is an intermediate easy reader - not quite a beginning chapter book, but definitely for a more advanced reader. It's slightly larger than a traditional easy reader and has a smooth layout that's very appealing and engages the hands and eyes as well as the mind. It's similar to the early chapter books that have been increasingly popular in the past year, like the easy versions of Judy Moody and Hank Zipzer or DiCamillo's Tales of Deckawoo Drive. Verdict: It looks like the beginning of a series, but I don't see any additional information on future titles. While it's not a really stunning stand-out, it's a sweet, simple story that will engage readers and make an excellent addition to your easy reader section. This is one of those titles that really didn't grab me but which my younger patrons love. Eleven-year-old Jimmy has a boring life. It's true. His mom works all the time, his dad is looking for a job so he can work all the time, he's too shy to talk to girls, especially sweet Daisy Flowers, and all he and his best friend do is argue about Jimmy's favorite mystery tv show and vampire books. He's a dweeb and he knows it. But all that is about to change when he gets The Blotch on his face and guilts his dad into getting him a dog from the shelter. Soon there are mysteries, bullies, and drama galore and he's wondering if his new pet Abby is a little more than she seems...or has he really watched too much tv? This is a light and funny mystery plenty of younger humor and trials and tribulations - talking to girls, dealing with parents, and struggling with changing friendships. The art added an additional humorous dimension. I did feel that the characters, family dynamics, and situation were not as fully developed as they could have been. How does Jimmy's family have no financial difficulties with only one working adult? Their acceptance of the babysitter felt a little hasty to me as well and the mystery felt rushed and thrown in at the end. However, the point of the book is the humor and Jimmy's viewpoint, which is naturally stuck on what affects him personally. The hardest part for me to buy was the resolution with the stereotypical bully, where he admits he was taking his anger on his family situation out on Jimmy. Verdict: This isn't an award-winning and deeply meaningful piece of writing, but it's a fun, relaxing read and has been consistently checked out at my library. Fans of Bunnicula and Greenwald's other titles will enjoy it. I actually got the later book in this series, Whose Truck? before I realized there was an earlier title. I'm a little leary of lift the flap board books, but sometimes they're worth it. The page on the left is a bold color with a simple border and starts with a question about the layer of the house they are building. On the right side are the tools and their names. The entire right side lifts as a flap, showing the worker beneath using the tools. So the first spread is brick red and says "To build a house, start down low. Whose tools are those? Do you know?" and on the right is pictured a chalk line, chisel, joiner, and float. Lift the page and see the masons laying a foundation. The pictures are cute and cheerful with little eyes on the tools, silly details to look for, and a diverse population of smiling workers, including many different skin colors and women as well as typical male construction workers.The big flaps feel pretty sturdy, but I can see them separating at the fold fairly soon. However, with something this fun and potentially popular, it's worth a few replacements and some strengthening tape would probably help too. 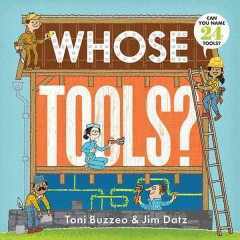 Verdict: This is a must-have series for little ones who are obsessed with how things are made and you may even find older kids sneaking it out of the board book section. It can be difficult to find picture books that are suitable for very young, toddler audiences. However, although I originally passed this one over because the cover didn't grab me, upon closer inspection it turned out to be exactly what I was looking for. Dog prepares for bed as he listens to the sounds of the evening and remembers his day. He remembers the words he knows, the games and fun of the day. Now the day is over and dog takes one last walk through the house, checks his people, and goes to sleep. The simple, lulling text is complemented by Malone's blocky, simple illustrations. The only face is of dog's girl, mostly shown sleeping or pressed tightly against his fur. The illustrations remind me of the broad outlines and simple colors of Laura Dronzek's work, although Malone's art is very much her own. The simplicity of the art makes it perfect for small children both one-on-one and in a group to follow along the story and share their own experiences of the day, words they know, and bedtime routines. Verdict: Use this at bedtime with your little one or in a bedtime or dog-themed toddler storytime. The slow pace of the story may lose listeners, but if you make it interactive - finding things in the picture, asking about their day to compare, you'll quickly pull them back to the lilting rhythm of the story. I couldn't put this down. Well, I mean I could - I had to because I was reading it during my lunch minutes, but I zipped through it as fast as possible and can't wait to recommend it to absolutely everyone. Starting with his humble origins as a cooper, Seiple tells the story of Pinkerton's rise to fame as America's first private detective, including his work as the head of a network of spies during the Civil War and his last battle with the James outlaws. The book opens with a helpful list of characters, including the Pinkerton agency and their rogues' gallery. An epilogue explains the changes in the Pinkerton agency after Pinkerton's death and how it became a well-known security agency after ups and downs over the years. Source notes and an index are also included, as are black and white photographs throughout the book. This was absolutely riveting. Seiple doesn't exaggerate or dramatize Pinkerton's life, but she writes a fast-paced narrative that grabs the reader from beginning to end, encapsulating the different major cases of Pinkerton's life and adding insights into his character, operatives, and the historical context. There is a certain amount of death and violence but it's presented truthfully without gratuitous graphic details. Seiple includes Pinkerton's female operatives, another first, and gives generous page-time to these overlooked historical figures. 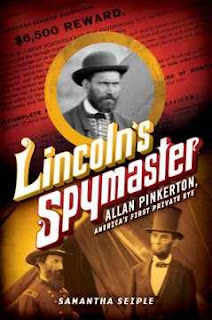 Readers will breathlessly follow Pinkerton's exploits as he protects Lincoln from potential assassination, his operatives track down spies and information during the Civil War, sometimes with tragic results, and Pinkerton's sons attempt to track down the James band of outlaws. I have to wonder if other reviewers actually read the book. Usually, I skim other reviews to see what others thought and while I could see disagreement in Seiple's prose (some reviewers find her bland while my patrons and I love her matter-of-fact and brisk delivery) some things mentioned in the reviews are just....wrong. One says there is no index. Uh, yeah, there is, it's five pages long! Another says it's classified as a fiction novel. Um....where is it classified as that? It's definitely nonfiction, with plenty of original sources and notes. This annoyed me. Verdict: I can definitely sell this to kids on its own; read about the first private detective in America, his network of spies, and how they saved Lincoln's life! Even better, it's a great tie-in to Kate Hannigan's novel, The Detective's Assistant, which focuses on Pinkerton's first female operative. I have lots of fans of Hannigan's zippy prose, breathtaking adventure, and extras and they will be thrilled to read the real story behind the story. I Survived fans ready to move on to more challenging titles would be a good audience for this as well. Highly recommended. I had a board meeting in the afternoon. It is snowing. Unfortunately, Jess is still in a House of Sickness, but she set everything up and it was pretty awesome. About 20 kids and parents came and really enjoyed the different activities. Day off! It's a nice day. I threw this in the cart when I was buying new easy readers in a hurry last year and it's checked out quite a bit. I finally got around to reading it and, to be honest, I was less than impressed. Aaron the alligator plays with his friends, three stick figures in red smocks. They watch football on tv and play together. They get dressed for Halloween. They pick apples. Eastman's classic art is recognizable but not particularly outstanding. The whole book has an odd, chopped-up feeling. This is explained when you realize that the book is a reissue of a 1967 title with illustrations taken from The Cat in the Hat Beginner Book Dictionary. It's an easy read and the illustrations have a classic look to them. Fall-themed books are always popular and the alligator hints at silly antics. It's checked out quite frequently, but I think readers might be disappointed when it turns out to not be as funny as it seems. Verdict: While this isn't anything too exciting, it's good enough for a fill-in title. Beginning readers need a lot of titles to go through and this is fine for that, although it's not something I'd recommend if you have a limited budget or space. Danny wakes up one morning feeling cold. Not just normal cold, but weird cold. Unfortunately, his mom is out of town and his dad isn't so good on the "diagnosing weird cold feelings" front. Fortunately, his friends Wendell and Christiana suggest calling his great-grandfather who lives in mythical Japan. One bus ride later, Danny finds out that his fire has gone out! The only way to relight it is to eat a phoenix shell (but not the baby phoenix of course, because that would be Not Cool) and the only way to find one of those is to go on a quest to the Farthest North. Ursula Vernon's trademark humor shines through in this last adventure. There's a deeply satisfying ending, which is not in the least saccharine or didactic but leaves the reader with the feeling that her characters will live on, even if we no longer hear about their adventures. Danny's enthusiasm is undimmed, even when he's feeling the worst. Wendell continues to overcome his cynicism and anxiety to come through for his friends, old and new. Christiana has abandoned none of her scientific curiosity and devotion to logic, but she's learned to roll with Danny's weird world and just examine the science behind it later. Verdict: It's been a long, funny, and thoroughly enjoyable journey. 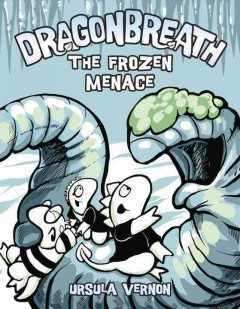 Buy an extra copy of the first Dragonbreath book to celebrate and don't forget to continue to promote the series even though it's over and Vernon is moving on to another exciting and unique offering! This is a new series in the Little Bits imprint of Bearport, which publishes easy readers. It features a number of South and Central American countries and several Asian countries as well. 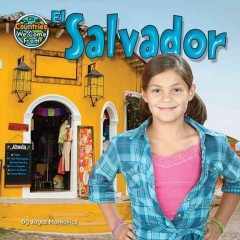 This particular volume presents some simple facts about El Salvador. It talks about the country's geography, including volcanoes, the cloud forest, and agriculture. A simple history of the country and culture includes some basic Spanish and a few facts about the native Indians. There is mention of some of the culture - the flower festival and Quinceaneras, food and soccer. Back matter includes a list of basic facts about the country, glossary, index, and a few titles for learning more. I'm in two minds about this one and the photographs are part of that. They show a pristine wilderness, dramatic volcanoes, and happy, smiling children and adults. But...El Salvador has serious issues, especially with children in poverty. On the other hand, this is a simple easy reader and you don't necessarily want or need to introduce serious issues into a book that's supposed to convey basic information while allowing children to practice their reading skills. Verdict: On the whole, I think I'd say yes to this one although it's not what I'd choose to fill in a juvenile nonfiction collection on countries. As an introduction to other countries, especially ones kids are likely to have a connection to, either personally or through other kids they've met, it adds some diversity to an easy reader collection. 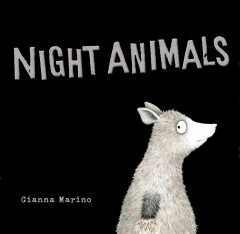 One of the things I love about Gianna Marino is that, although she has a unique and recognizable style, she still manages to make each one of her books stand out on its own. I loved the gentle lesson of Too Tall Houses, the beauty and warmth of Following Papa's Song and now she brings us a humorous tale of exaggerated fears in Night Animals. I found this hilarious. The humorous details - possum's unfortunate encounters with skunk, the panic-eyed predators, deadpan comments, and surprise finish made me laugh out loud. Marino's illustrations are delightful. Against bold black background are brightly glowing fur, eyes, and finally the moon. 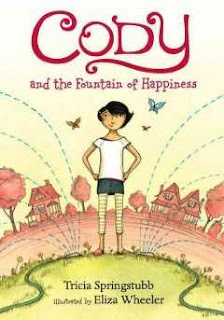 Verdict: This would make a great read-aloud with plenty of giggles for the kids, or an even more humorous puppet show. Recommended. 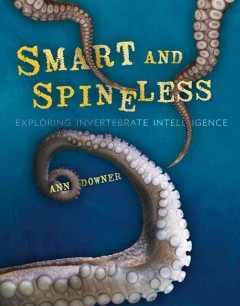 Downer explores not only the intelligence of invertebrates, including current research, she also discusses what it means to be smart and how scientists are changing the measurements. Worms, spiders, octopuses, bees and wasps, ants, mantis shrimps, box jellyfish and slime molds are separated into chapters. Each starts with a set of basic facts about the animal - its common and scientific name, relatives, habitat and habits, and brain size, if measured. The book is prefaced with a discussion of intelligence in vertebrates and invertebrates and finishes with an overview of several invertebrates possibly intelligent behavior and why it matters. Detailed source notes, glossary, bibliography, and extensive further information on each creature featured is included in the back matter. The book includes a rich treasure trove of photographs, additional information, historical details and context, and references to current research into intelligent behaviors. With all of this awesomeness, who would NOT want this book? Well, there are two drawbacks. First, the type is pretty small. It's a normal size for an adult nonfiction title, plus being broken up with the photographs and additional information, but a lot of kids will flick books open, see the small type, and not even try. Secondly, this is from an imprint of Lerner that is super expensive - over $20. It's hard to convince myself to shell out that much for a book that is not going to fly off the shelves. Verdict: But....it's soooo good! Informative, beautifully written, fascinating....I think I'm going to splurge on it and put extra effort into convincing kids to give it a try. Middle school is the most likely audience, since it's a challenging read but overall a slim volume under 100 pages. My desk on Friday. Not pictured: My inner turmoil. Oh boy. I made a concerted effort to clear some of the projects off my desk and cart, but bogged down in the evening when there were incidents and busyness and crazyness. A patron told me it's all due to five planets colliding or something and I'll take it. I felt exhausted and disorganized, but still managed to get a fair amount of work done. I don't LIKE drama, it makes me upset. Had a miserable headache most of the day. However! Looking on the bright side! Nice compliment from a mom on how welcoming our children's area and library in general is. Teacher I put together high-level fiction remote collection for wants to do a unit on nonfiction which makes me happy. Book club kids loved Hamster Princess. Kids bouncing off walls. Voice gone. Trying to catch up. Decided to clean out the basement so we could find things. My desk is a mess. I feel disorganized and behind on everything. Everyone is out of sorts. Sigh. Due to low sign-up and Not Being Ready we decided to postpone Mother Goose on the Loose until May. My car made a weird clicking noise. I worked about a half-day, cleaning things up and generally trying to catch up. Realized I told everyone yesterday that next week was Messy Art Club and we were going to paint. It's Lego Club. Sigh. Went home to clean my own apartment. This is Pattie's big Valentine party. I came in to help and clean up glitter and do more work. I have only myself to blame for feeling yech since I didn't eat breakfast though. Goodbye week. I will not miss you. I rarely read sequels, but I wanted some relaxing reading and took home the newest Bad Kitty for myself. Bad Kitty may be bad, but she's always been a happy, healthy kitty. In her own way, of course. Until today. When a kitty stops eating, what happens? The dreaded...VET! Will Bad Kitty survive her traumatic experience? More important...will everyone else? The blended graphics and text deliver another laugh-out-loud adventure from Kitty and her "friends." Fans of classic cartoons, especially Tom and Jerry, will get a big laugh out of the kitty heaven sequence, especially Kitty's desperate attempts to atone for her previous nastiness to Poor Puppy. One of the things I love about Bad Kitty, asides from the humor, illustrations, and popularity with kids, is their diversity. Have you ever sat down and counted how many anthropomorphic characters are male? Or found yourself referring to animals as male even if it's not delineated in the story? I've been making a conscious effort to break myself of this habit over the past few months and once you start looking it's everywhere. In rhymes, picture books, chapter books, etc. Bad Kitty is one of the few female animal protagonists and, even more rare, she's one bad kitty - nothing sweet and dainty about her at all. In addition, when the rare human character shows up, they are just as likely to have dark skin as not - for example, the veterinarian in this title. Verdict: Another hilarious entry in a popular series. Your library should definitely own the whole series and, if you are a larger library, multiple copies. 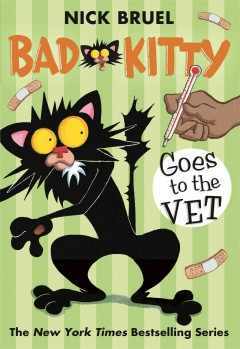 Bad Kitty also makes a great read-aloud for younger kids and a good book club selection. I reviewed the first Stratford Zoo title for No Flying No Tights and I loved it. Unfortunately, it really didn't circulate much despite my booktalking and I was disappointed but sadly decided not to purchase the second volume. However! A young patron desperately wanted to read the next book and no other library had purchased them. So I got to buy it after all! I didn't like this one as much as Macbeth, but it was still fun. The zoo animals are putting on another production, this time of the tragedy of Romeo and Juliet. A rooster and a bear, representing the petting zoo and the wild animals, find themselves becoming best friends. Unfortunately, their friends and families do not approve and Juliet's father wants her to be best friends with a lion! A wise owl has a clever plan, but things keep getting wrong and in the end....they both end up hibernating together. I loved the silly chatter of the audience, the side story of the lamb and monkey kids fighting, and the dramatic hilarity of the story. I did feel that substituting the best friends/playdate/hibernation for the love/marriage/death was a little silly. I'm pretty sure most kids are going to realize that in the "real" story they die. I do love Giallongo's art - there's no fancy artistic subtleties to it, just strong, classic cartoon art with his own style keeping it unique. Verdict: I still think these are delightful fun and I can't wait to see what's next - the book says they're going to tackle a comedy! but I have to admit they haven't clicked with my audience. However, as long as I've got at least one (two including me) fan I will definitely keep purchasing them and trying to think of fun ways to promote them. This is part of Bearport's Little Bits imprint, which publishes easy readers. This particular series explains the life cycle of plants including apples, coconuts, cranberries, oak trees, pumpkins and sunflowers. 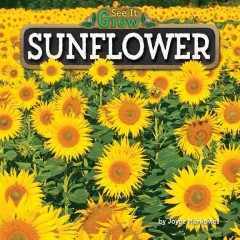 The book begins with germination, follows the sunflower through growth, budding and flowering, and and talks about the animals who use the pollen and seeds. A final set of facts adds some more details about sunflowers. A simple glossary defines the words bud, pollen, roots, shoot, and stem. There is a simple index and a few additional titles to read. The large font, simple language, and bold photographs make this an excellent easy reader. On the other hand, Bearport's easy readers are an odd shape - this one is 8x8 - which offends my sense of order. They're also much more expensive than the average easy reader. I am more likely to expend the money to purchase animal titles from Bearport, which are guaranteed popularity in the easy reader nonfiction section. However, with many kindergartens doing units on the plants included in this series, I think it would add a great dimension to the themed baskets I pull for them. Verdict: Well-written and an excellent lay-out, but make sure it's a topic your library can use before expending the money. There's a bit of buzz going around now about a newly discovered (i.e. they dug through her attic) manuscript from Beatrix Potter which is to be illustrated by Quentin Blake. Apart from my own feelings about attic books (not favorable) I don't understand why they picked an illustrator whose art is so dissimilar to Beatrix Potter's delicate drawings. 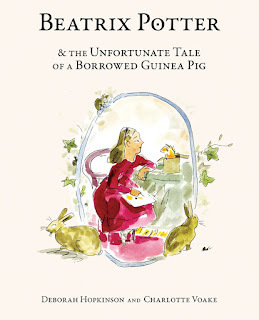 I was happy to see that this subtly humorous tale of Potter's childhood did not make that mistake, being illustrated by Charlotte Voake who, although she has her own definite style, feels more evocative of Potter's taste and art to me. The story begins with Beatrix Potter and her intense interest in drawing the natural world around her. However, during her childhood in the city, there was not much access to the natural world. Beatrix never let that stop her, however, and she and her brother collected a wide variety of pets. Unfortunately, they did not have a guinea pig and Beatrix dearly wanted to draw one. So, she borrowed one from the neighbor next door, a fine animal named Queen Elizabeth. Unfortunately, despite Beatrix's best intentions, Queen Elizabeth came to an...unfortunate end. Beatrix attempted to make up for the sad demise with a delicate portrait but if you were the bereaved Miss Paget, what would you have done? 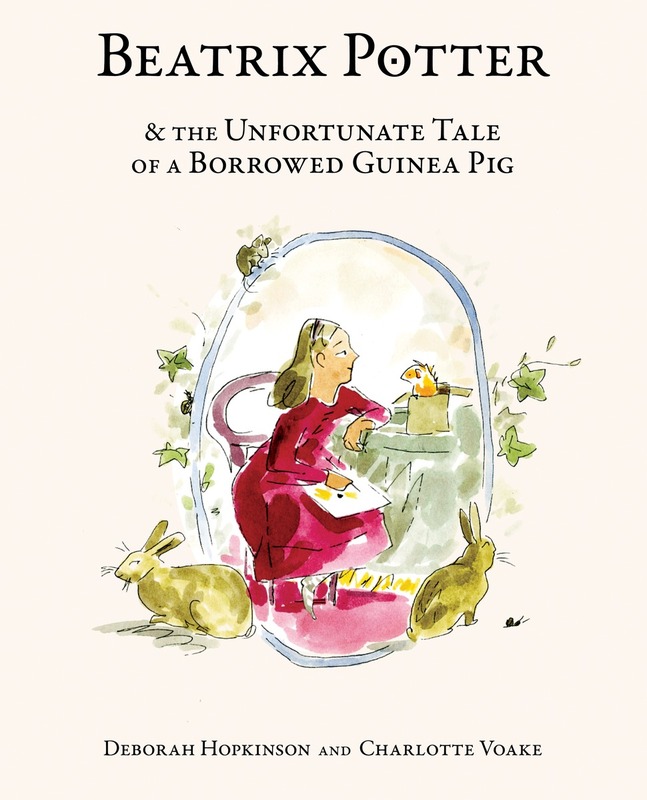 The author continues with a note detailing Potter's later life and the later discovery of a portrait of a guinea pig, drawn about that time, which sold for an extensive sum. A detailed author's note, complete with photographs and primary documents, gives more information about Beatrix Potter's life and legacy along with sources of quotations and a brief bibliography. Charlotte Voake's delicate watercolors are the perfect accompaniment to this delightfully Victorian tale, with tiny drawings of the various animals, reproductions of entries in Potter's journals, and elegant spreads of Beatrix Potter's world. While I personally loved this story and the delicate art that accompanies it, it's unlikely to be a title that flies off your shelves on its own account. The tongue-in-cheek humor, while it will give a giggle to older readers "You can guess what happened next. That repast of paper, paste, and string took its toll. In the night the queen expired." will probably fly right over the heads of younger listeners. It's also a fairly lengthy text and would need a patient audience to sit still for the entire book while the more advanced vocabulary will need a good reader to wade through on their own. Verdict: Although this doesn't have universal appeal, it's one that certain, specific children and their parents will love, especially if they are fans of Beatrix Potter. Occasionally I will purchase titles with limited appeal for certain segments of my audience and this is one that falls under that heading. If you have an audience for this type of book at your library, it's definitely the one to purchase this year in that category. The simple text, interspersed with photographs, explains the life cycle of a moon bear while introducing different bears from the sanctuary where the photos were taken. It talks about their abilities, their sense of smell and hearing, and their diet. 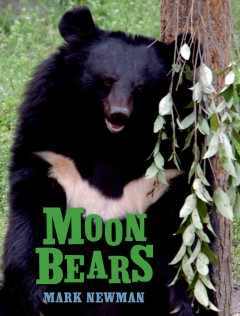 The book explains how moon bears interact and how this is different in the wild and at the sanctuary. The back matter gives an additional list of facts about bears, more facts about moon bears, and an author's note explaining the inspiration for the story and the story of the moon bear sanctuary and the people who helped with the book. This book features one of my favorite layouts in easy nonfiction - bold, simple captions that can be read aloud to the youngest audience and longer, more detailed text for older audiences. This book just might have the best combination ever, which each caption being a an active or informative sentence about bears that toddlers will be able to understand and even participate in "Ginny can run quickly on all four legs./Moon bears can stand on their back legs quite easily, too." The longer text is still simple and direct, perfect for an older preschool or kindergarten audience while younger elementary students will be able to begin reading the book on their own. Verdict: Informative, accessible, and full of adorable photographs of moon bears! 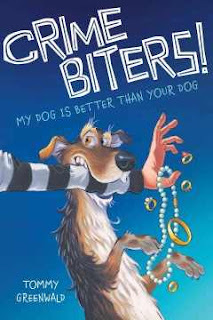 I will be strongly encouraging all my neighboring libraries to buy copies of this title so I have enough to use it in my beginning readers book club. Highly recommended. Oy. Packing outreach baskets, sending out emails, meetings, meetings, planning, crazy. On top of all that it's not even snowing! And I can see the grass! Everyone was expecting vast amounts of snow. It rained. It slushed. It iced. I am disappointed. A fairly large group came to book club anyways though. It snowed for, like, 5 minutes. While I was walking to the car OF COURSE. Vast amounts of paperwork were tackled today. No kids programs, but I came in late b/c I was supervising the knit-in until 10pm. Very busy last few hours of the day! Usually, I really don't care for these slice-of-life type of books and rarely buy them since the kids don't check them out often. But this one really grabbed me and I thoroughly enjoyed it. Cody is excited about the start of a wonderful summer. She's going to enjoy it with reading, watching ants, and hanging out with her family. But it's a little bumpier than expected with her teen brother Wyatt struggling at his science camp and in love and a maybe new friend named Spencer who has a lost cat. Not to mention her mom's new job that isn't going as well as she'd hoped. Fortunately, after some tears and struggles, all ends well. I loved the depiction of a warm and loving family going through everyday problems. The characters are realistic and have fights and arguments, especially when Cody's ideas don't turn out as well as she'd hoped, but underneath they're basically kind and trying to do the right thing. Nobody dies, gets divorced, has life-threatening illnesses, etc. It's just a simple story of a happy summer with ups and downs. Verdict: I really loved this - the writing was lovely, the characters realistic and people I'd want to meet, and whole story was just very happy. I liked that the main characters were diverse without it being the point of the story and that Springstubb didn't fall into the "diverse best friend" trap. On the other hand, I'm not sure how many kids would actually check this out. It's a little long for a beginning chapter book, but not quite long enough for the middle grade kids that will read this type of slice-of-life story. It would make a nice read-aloud for younger kids though. I'll have to think about it some more. Lotta awakes at a very different time and place; she is with a whole clan of Sami, following the reindeer. She experiences adventure, heartbreak, and the warmth of family before awaking. But her adventure has left a special surprise for both her and her great-grandmother. The simple line illustrations carry over the same sweet, cozy feel of the cover. Although darker points are touched on - Sami children being forced to abandon their heritage and go to school, reindeer dying, etc. there is a gentle, happy feel to the story overall. Verdict: I really liked this. It introduces a culture and history new to most readers, has cute animals, and is just an overall happy, interesting read. Not available in the US unfortunately though. I don't know how accurate the representation of the Sami is, but it's a nice introduction. 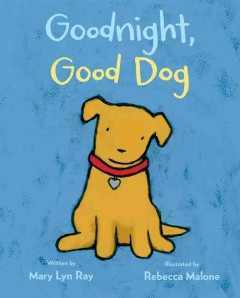 Cheerful rhymes and silly pictures fill this book that pays homage to the classic Go, Dogs, Go easy reader. One after another the dogs parade through the book - cold dogs, hot dogs, black dogs white dogs and a little bit more, every few pages, of that long, long dog. How long is that dog? 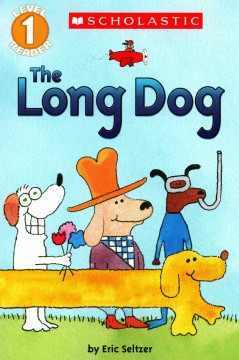 The book ends with a picture of all the dogs holding up goodbye signs and one last silly sign from the long dog. The pictures are cheerful, if a little out of focus and fuzzy in some cases, especially in the small details. I personally thought the giant pink bow and skateboard of the gal dog and guy dog was a little annoying - there was no need to stereotype what is supposed to just be silly dogs after all. The text is bold and clear with short, simple sentences and repeated phrases "This is a high dog./This is a low dog." and is a good fit for kids who need just a few words on each page. Verdict: Not a stand-out, but a perfectly serviceable filler, especially if you're looking for more level one, very easy easy readers. I feel like there was a little initial buzz about this book and then it seemed to slip from everyone's minds. This is too bad, because it's a wonderful book on several levels. 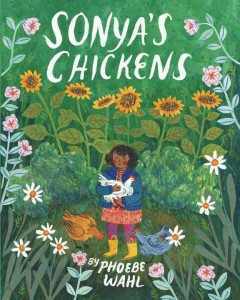 Sonya, a sturdy girl with rich, dark skin and exuberant curls, is given three speckled chicks by her father. Under her care, they grow into plump, healthy chickens and begin to provide eggs. But one night, there is a disturbance in the coop and when Sonya runs out to check...one chicken is gone. 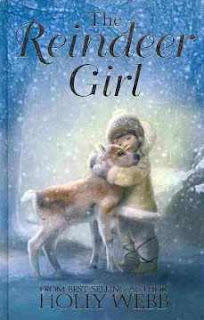 Her father comforts her by telling a story about the hungry fox who wants to feed her family. Sonya makes a grave for her lost chicken, but thinks also of the fox kits in the woods, no longer hungry. She and her family repair the coop and one day one of the eggs begins to hatch! The illustrations are a rich blend of watercolor, collage and colored pencil. The landscape feels almost like a fantasy forest with towering flowers and tall trees. One of my favorite spreads is a night scene with the trees, buildings, and skyline dimly shown in the dark landscape adn a glowing moon and stars overhead. It's not a perfect book; in places the text is too lengthy to make a good read-aloud and it occasionally strays into didacticism. However, the rich, lovely illustrations and the simple descriptions of caring for a beloved pet and accepting that sometimes sad things happen are heartfelt and touching. Verdict: This is a good title to enjoy together with a special listener or to read in an abridged format with a younger group.